Yesterday the side show post the Semi-Finals finished in a 3-0 win for Holland over Brazil, and now the biggest game in all of Football, till the next World Cup Final is upon us. There will be League Matches, Domestic Cup Finals, UEFA Champions’ League Finals, Copa Libertadores Final, European Championships Final, Asian Cup Finals, and all other manner of high-profile matches and Finals, but none of them will compare to the next World Cup Final. That is how big the occasion tonight is, and both teams will want to give it their best. Before I move on to the Final itself, I would like to say a word about the side-show that played out yesterday, not so much about the actual match itself, but the concept of their being a 3rd place playoff in the first place. The 3rd place playoff is a completely unnecessary event. There are is no need for that match and of all tournaments in the world, the Football World Cup is one where there is only one winner and no team plays to be second, and thus only first place is of relevance, and all other places including second place, don’t matter. So in a tournament, where even second place doesn’t matter, and is not considered an achievement, do we really need to know who the third place team is. In a medal sport, Silver is still considered a consolation of sorts, especially if there is an underdog, and consequently some value attached to the Bronze and thus finishing third in a medal sport has some meaning. In the Football World Cup, no one, not even the greatest of underdogs goes into the Final, thinking well atleast we have already finished second, because being second has no value here. No team has ever gone into the Football World Cup Final with any target apart from winning the final, and no losing Finalist has ever looked back on being runner-up as a consolation and said well at least they came second. So when no value attached to second place, what really is the point of having a match to decide who will be third? Even if for whatever reasons we must have a team labelled as being the third best team of the tournament, then instead of having them play another match, FIFA could simply award the third place to the losing semi-finalist who has the better goal difference, or if that is level then to the losing semi-finalist with more goals scored, or failing that fewer goals let in, or fewer fouls, or if nothing else is enough, then just flip a coin. The third place playoff generates about the same level of interest an inconsequential group stage game where both teams have been eliminated. In the 3rd place playoff both teams have been eliminated from the World Cup and which of them finishes 3rd means nothing to anyone. Anyway what last night’s match showed us that Brazil who for so long have been the Custodians of the beautiful game, and who regardless of where they finished have always dazzled us with attacking football, need to start producing some attacking players if they want themselves to continue being the Custodians of Football. 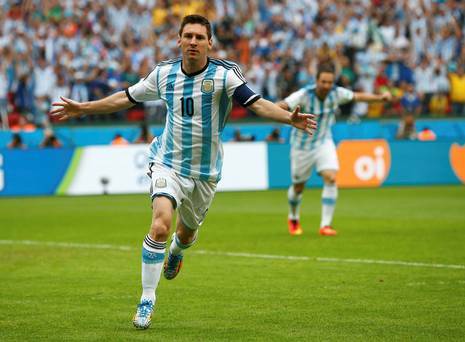 Moving onto the big event itself, the match has a sense of Romance attached to it and that is because of Messi. No player could ever really lay claim to being in the absolute top-tier of Footballers unless they win the World Cup and what is more lead from the front to help their country do it, and while many teams win the World Cup it is not often that the greatest player of the generation has the chance to win the World Cup for his country and etch his name among the greatest of the greatest. Pele did it, Maradona then joined him and off late Zidane and Ronaldo, for his exploits in 2002, have done it, and in many ways these four players are the absolute top-tier of Footballers. While teams win the World Cup, but with a World Cup win a new name doesn’t automatically join this list. Messi has been the greatest of this generation, but till he lifts the World Cup, he cannot lay claim to being in the elite list, and if he does, then nothing can keep him from being mentioned in the same breath as Pele and Maradona. Will Messi Join the Elite List of Pele, Maradona, Ronaldo and Zidane? The greatest player of the generation doesn’t always play the World Cup finals, and has the chance to write his name in the stars, and this time Messi has the chance to do that. 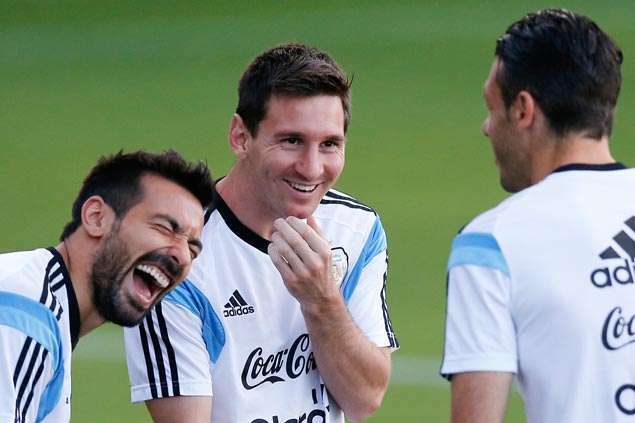 Should he help Argentina win the World Cup, then no doubt Messi will join the elites of Football, and this adds a sense of additional Romanticism to the occasion and has all the Romantics rooting for an Argentina win. An additional factor for all the romantics rooting for Argentina is that the German side are almost mechanical in their efficiency and the romantics find it hard to associate with their mechanical ruthlessness. The German side turn up, and with mechanical precision do their job and then go off the field and what is more they have been mechanically this consistent since 2002 and this is their fourth straight appearance in the semi-final or beyond, in a World Cup and no one could match this consistency in history. There is another rather odd co-incidence at play here for the finals, and that is that both Brazil and Italy won their fourth FIFA World Cup 24 years after they won their third, and this World Cup is 24 years after Germany won their third World Cup in 1990. Perhaps it takes 24 years for the next generation of players to be ready to lift the World Cup again !! 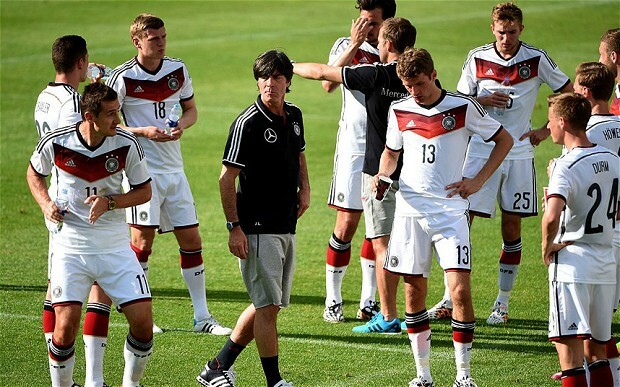 Germany ran riot against Brazil and that performance in the eyes of many makes them the favorites going into this match. However don’t expect a similar goals tally to be replicated in this match, because Argentina midfield and defence will ask more questions of the German attack line than the Brazil side did. Brazil put no pressure whatsoever on German side and while the marking for the first goal was shambolic to say the least, even for the rest of the match, the Brazil side did no pressing, there was little tackling and any German player on the ball had all the time he wanted to decide what he wanted to do and who to pass to. As a result the German attacking midfield which had struggled so far sprang into life and Ozil and Kroos who had been disappointing till the semi-finals, were pulling the strings and running the show, and what a show it was. Argentina will not be quite so polite and there will an Argentine midfielder, most likely Mascherano, in their face the second they touch the ball and it would be a surprise if a German midfielder in the Argentine half could get more than two touches on the ball before a tackle comes flying in. On their part the German midfield will look to do exactly the same to Messi, and he will be given close attention, right through. The match will therefore be very likely a scrappy affair and goals will be at a premium. In such scrappy affairs, it is usually a set piece or a second of absolute individual brilliance, a dazzling run, or a through the eye of the needle pass, that decides the outcome of the match and both sides have plenty of players who could provide this. Ultimately the match will come down to how well Mascherano controls the midfield, because if the German attacking midfielders start finding space and are not closed down quickly then they will hurt the Argentina side. 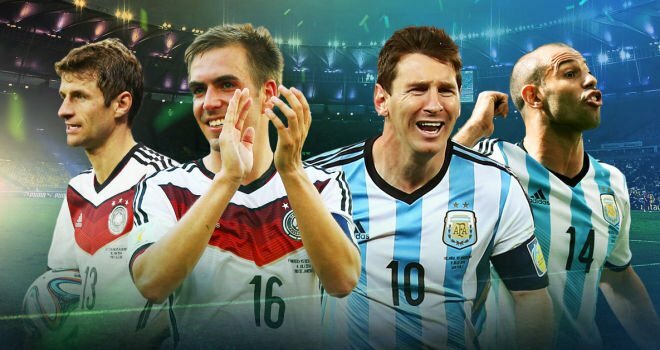 Germany have the task of controlling Messi, but because the Argentina side has one real outlet, Germany will find it easier to control the one player, than Argentina will find to control a more varied German attack, and thus Mascherano’s efforts become crucial. Key Factor – Lionel Messi, is the obvious one here and he provides such an X-Factor that if he comes into his own, tactics will go out of the window. Messi has risen to the challenge and the final could have him even more determined than ever. RESULT – This one is very hard to lean either way. This will be a scrappy affair, and not many goals are likely. The match could go into extra time or even penalties. All said and done, I picked Germany before the Final to win and I would stick by that decision.